As food science and our understanding plant proteins expands by leafs and stems, some food-thinking entrepreneurs are looking for ways to make our agricultural products safer, more environmentally sustainable, more humane, and yes, cheaper. Recently, I paid a visit to food science startup Hampton Creek Foods to learn about one such undertaking: the quest to make an egg out of plant proteins. I first heard about Hampton Creek Foods' project, Beyond Eggs, in a post on the sustainability blog Inhabitat, and when I mentioned it to a vegan friend, she quickly put me in touch with someone from the company. Next thing I knew, I had an appointment to tour the Hampton Creek Foods facility and taste eggless cookies and mayonnaise. The facility is planted in San Francisco's SoMa neighborhood, in a spot filled with body shops and software startups. And when I walked through the door, Hampton Creek Foods did indeed look a lot like a software startup. It's a small but efficiently used space, where you're immediately greeted by the glow of Apple screens and a friendly Golden Retriever (Jake, who was introduced as an official taste tester). But instead of standing workstations, the myriad laptops are propped up on kitchen scales. The work tables are packed not with desk toys but Kitchenaid mixers. Instead of a pool table, there's a library of mayonnaise. And instead of cooking up software, the employees are baking cakes in test tubes. "We think that our food system is broken," explains Joshua Tetrick, Hampton Creek Foods CEO, "and broken from the inside out. And we don't just think that it's broken in the United States, but broken all over the world." Tetrick says that he was interested in tackling one aspect of the animal agricultural industry—from which the Food and Agriculture Organization of the United Nations estimates 18 percent of all greenhouse emissions flow—and improve it through science. He selected the battery cage egg. "Now, I'm not talking about free range [eggs]," he says. "I'm not even talking about cage free. And our explicit focus is the battery cage egg. We're trying to focus on the most abusive, the most environmentally unsustainable, the most inhumane, the most food safety issues." The problem, Tetrick says, from a consumer standpoint, is that a person who is concerned with the welfare of hens might make the effort to purchase free-range or cage-free eggs. But one-third of eggs laid in the US land not in cartons but in food products: cookies, muffins, mayonnaise, salad dressings. "Cruelty thrives on this abstraction," says Tetrick. "And nothing is more abstract than eating a chocolate chip cookie with a battery cage egg embedded inside it." To that end, Tetrick and his colleagues at Hampton Creek Foods are trying to create an egg substitute made entirely out of plants that can perfectly take the place of eggs in all of those food products. It's not an easy task, however, because the egg is such an amazing food item. "Who would have know that," Tetrick pauses, "and I'm sorry to be crass about it—the end result of a hen's ovulation cycle would do so many amazing things in food? It causes a muffin to rise, oil and water to hold together in an emulsion. Rather than try to replicate all of the features of the egg all at once, Hampton Creek Foods is instead attempting to replicate how eggs function in specific products. Tetrick touts an egg that works particularly well in cookies and another that makes delicious muffins. Plus, they've had success with mayonnaise and dressing that mops the floor with Vegenaise (more on that later). Their goal is to eventually create a single product that can function as well as an egg for every purpose. It's a lofty goal, one that makes the how more interesting than the why. Hampton Creek Foods has assembled a diverse team: molecular biologists with backgrounds in HIV gene therapy research, vaccines, and parasite-targeting drugs; food scientists with a passion for emulsions and baking ratios; Chris Jones, former Chef de Cuisine at Chicago's MOTO Restaurant (and, for fans of Top Chef, a Season 9 contestant). Chris can tinker with a bunch of different gums because he's familiar with them from the gastronomy world and then I can help him design a response-surface methodology experiment with five variables changing at the same time so we can see how they affect each other. And we can reach out to Josh [Klein, senior scientist in protein research] and say, "What's going on at the interface of the oil-water droplet? What are the protein configurations doing to the flexibility of the film that's developing?" And he can bring that protein aside to a deeper level than is in my background. But it all starts with that protein. Klein, who heads up the proteins team, likens their work to the work of a pharmaceutical company. Just as a pharmaceutical company keeps a library of compounds and their applications, his team is working to build a library of plant proteins and their functions. One plant protein might be particularly good at emulsifications; another might work particularly well in a meringue. 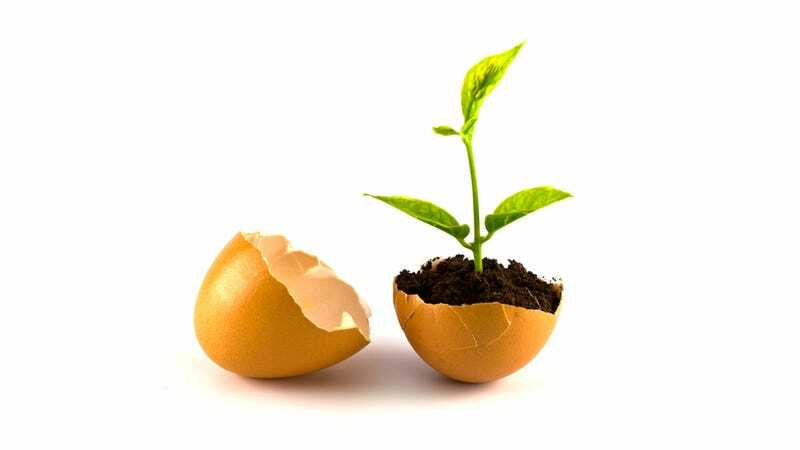 There won't be one single plant that answers all of functions of an egg, but by identifying and testing the functions of individual plant proteins, they hope to eventually combine them into the ideal egg substitute. Klein wouldn't reveal which proteins they have had particular success with, but he did say that some plants had proven especially fruitful in this department. And they aren't necessarily plants that one would intuitively suspect of being good egg substitutes. "So far, we've been surprised," Klein says. "We wouldn't have just intuitively guessed [which plants would work well]. That's what makes it a challenge—a fun challenge. If it were intuitive, it wouldn't be science. We have to design experiments around it." The testing phase is where things (potentially) get tasty. The proteins team will make tiny cakes in test tubes to test the functions of individual proteins, but the baking team experiments with the ratios in an attempt to create something that will behave like an egg when baked into anything from a cookie to a loaf bread. The company's fridges are backed with various doughs, each labeled and dated, to compare how each eggless version stacks up against its egg-filled counterpart. Beyond Eggs for Cookies is meant as a single substitute for eggs in cookie recipes; the idea is that consumers would swap out their eggs but keep their recipes the same in all other respects. At the moment, they have no such substitute for egg whites and yolks, although substitutes are in the works. We also got to taste one of the advantages of egg-free cookie making: dough that you can eat without worrying about salmonella. That brings us to the emulsions team, who seem to be having more fun with mayonnaise than anyone has any right to be having. One of the more miraculous abilities of eggs is their power to hold oil and water stable, lending mayonnaise that incredible shelf life. For each possible egg substitute, the emulsions team studies the mechanisms of the emulsions and how they break down over time, tracking the force being exerted on the oil droplets in the emulsion, how the gums are interacting, how viscous the emulsion is. Several times, Jones marvels at the way the emulsion team is able to quantify what he, as a chef, is seeing in the emulsions. Clement, who heads the emulsion team and whose eyes light up with excitement when explaining the unexpected behavior of a protein in an emulsion, shows off her experiments. She keeps a chamber at different temperatures to study how different formulations of mayonnaise break down over time. She points to the mayonnaise library, where Hampton Creek Foods keeps their myriad mayonnaises. (She jokes that her apocalypse survival plan involves holing up in the office and seeing how long she can subsist on mayonnaise.) She uncaps one of the sample mayonnaises and squeezes the jar. The emulsion breaks apart in the middle like a ball of mozzarella. Clement grins and explains it was made from a potato protein. Tetrick explains that Hampton Creek Foods currently works with packaged food companies to develop eggless versions of their existing products, although the team has developed a few recipes of their own. He says that the protein in Beyond Eggs is comparable to the protein in real eggs, with a difference of 0.1 percent. He also hopes that Beyond Eggs will be beneficial to those with egg allergies; although the team does not yet know if any individuals will suffer allergies to Beyond Eggs, the team is not using proteins from any of the allergens the FDA legally requires food manufacturers to list on packaging—not peanuts, no tree nuts, no wheat, no soy. And without the cost of keeping chickens, he claims that Beyond Eggs will be cheaper than eggs from a hen. The team is also working on a product that will cook like a scrambled egg, and Tetrick showed us video of a very early prototype. Although the product looks like scrambled eggs in the pan, Tetrick admits they're not ready for prime time. "If we wanted to cheat, we'd have you eat them right away," he says. Unfortunately, after about a minute, the scrambled Beyond Eggs deflate. Thanks to Hampton Creek Foods for letting me tour their facility, and if you happen to be in the neighborhood of 10th Street and Harrison in San Francisco, you might get pulled in for a cookie tasting test. I recommend it.